When we talk about face, our nose is an important factor in its appearance. This may be because it is the protruding and centrally placed feature on our face. Any deformities to it will highly affect our appearance. These deformities can be by birth or may be occurred due to some accidents. Rhinoplasty is the surgical correction or shaping of nose which has underwent some deformities. It is even performed in those individuals who has impaired breathing problems due to the structural defects in the nose. Increasing or reducing the size of the nose. Narrowing the opening of nostrils. Changing the shape of nasal bridge or nasal tip. Correcting the angle between the nose and the upper lip. Correcting the birth defect of nose or any injury caused. Getting relieved from some breathing troubles. 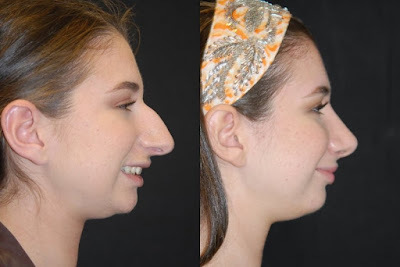 When you have decided for rhinoplasty, considering your facial features like, skin on your nose and the changes to be brought, your surgeon will develop a customized plan for you. This surgery that would take 1 to 2 hours, is performed under local or generalised anesthesia. In generalized anesthesia you will sleep throughout the surgery, but in local anesthesia you will be sedated and you will be relaxed and feel no pain, as your nose being sedated. During the surgery the doctor may make cuts within the nostrils and sometimes cut the base of the nose at some difficult cases. Then he will reshape the inner bone and cartilage, producing a pleasant appearance to your nose. The incision of nose are made inside the nose, so that at outer portion no marks are visible. Our clinics, ReconFace and Ojas Aesthetic, offers you the best rhinoplasty in Hyderabad. Our skilled and experienced professionals ensure the perfection in treatment by the increased number of success rates we have attained. Yes..you can be the Beautiest..